The kids loved the 'soup' as they called it and I loved the soft and soaked up dhoklas. Do try this tasty version the next time you make dhoklas. As for me , I am planning to make dhoklas just to make this Raswala dhoklas. And before we go to the recipes, a small word.As far as I looked up this is made with Khaman Dhokla, but I have prepared this with Palak Dhokla. 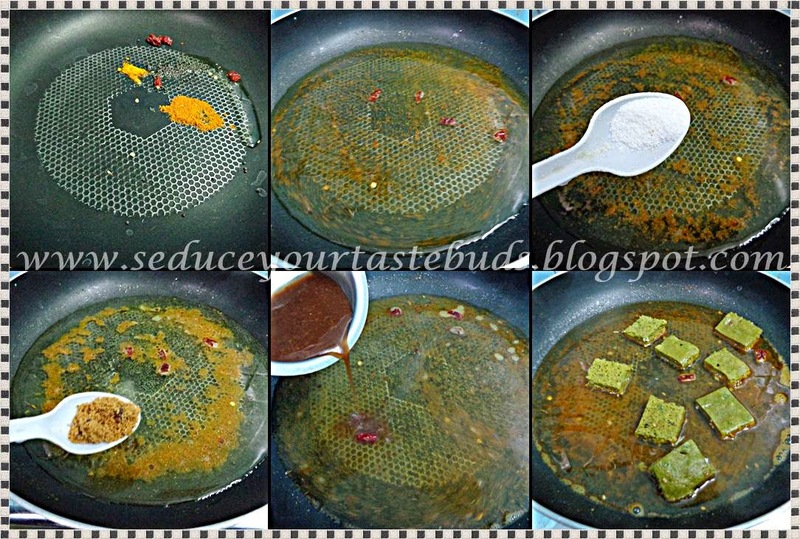 Heat oil in a pan and add the mustard and red chilies. When the mustard splutters, add the chili powder, turmeric powder, asafoetida powder and saute on low for a minute. Add water and salt. Add jaggery and tamarind extract. Bring to boil and add the dhokla. Simmer for 5 minutes and remove from heat. Be sure to adjust the chili powder, jaggery and tamarind so that it tastes sweet, spicy and tangy at the same time.